When 4 heads of broccoli only costs $.88, you have to buy more than you can eat that week! I did! I already had some in the fridge, and my MIL had some for me, but I couldn’t pass this one up! I can’t believe I am now stockpiling fresh vegetables! So I blanched it and froze it! 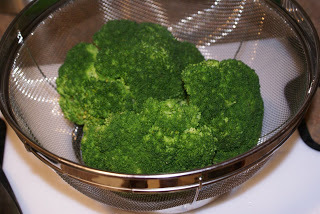 For great blanching instructions, click here. Now I’ve got 4 meals worth of broccoli for way less than $2! Yeah! 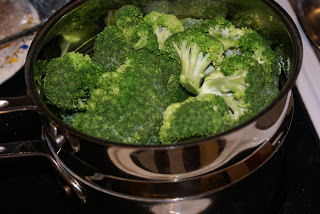 Broccoli that was steamed for 1-2 minutes. It just barely turned color! After blanching it in the ice water, I let it drain a minute in the strainer. 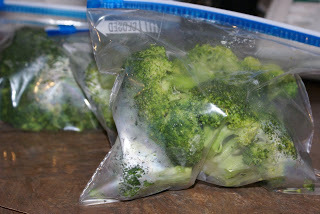 I put it into 4 freezer bags, a meal’s worth into each bag! I also got a great deal on celery…and seeing how it’s the start of soup season, I plan on freezing that too. Celery will be “mushy” upon thawing, but if you’re going to use it in a soup or stuffing, doesn’t matter! I plan to chop it and then freeze it in a Ziploc freezer baggie. You can freeze the stalk whole, but I don’t want to try to chop a mushy stalk!?! Good for you. I just did something similar to this with tomatoes this week. Fantastic idea. Why have I never thought of this? You can also freeze bell peppers simply by slicing them into strips–no blanching needed. A great way to stock up when produce hits rock bottom prices! I’ve also shredded and frozen carrots and keep them to add to things like soup. I don’t always like to run into big hunks of carrot and this is perfect for split pea of lentil soup. Just toss in a scoop. It spreads out well. I’m planning on doing this with the carrots and onions I have in my pantry this week. I need to add it on my high priority list.